The familiar green and brown colorations are only the beginning when it comes to the gecko, a nonblinking, warm-weather lizard. With more than 1,400 species that live in a wide range of habitats, geckos display nearly every hue, as well as decorative spots and patterns. Shades of brown or gray adorn most geckos around the world, found except in northeastern North America, northern Eurasia and Antarctica. These camouflaging colors help the geckos hide among rocks, dirt and sand from predatory birds such as eagles and hawks. Among the brown geckos are common house geckos (Hemidactylus frenatus), African fat tail geckos (Hemitheconyx caudicinctus), stump-toed geckos (Gehyra mutilata) and the Namib sand gecko, also known as the web-footed gecko (Pachydactylus rangei). Gray species include the Mediterranean gecko (Hemidactylus turcicus), native to Southern Europe and Northern Africa, and the Indo-Pacific Gecko (Hemidactylus garnotii), native to Southeast Asia, which are now firmly established in Florida. Green gecko species include the Madagascar giant day gecko (Phelsuma madagascariensis), one of the largest geckos in the world. It grows up to 9 inches long in its native habitat on the Big Red Island. 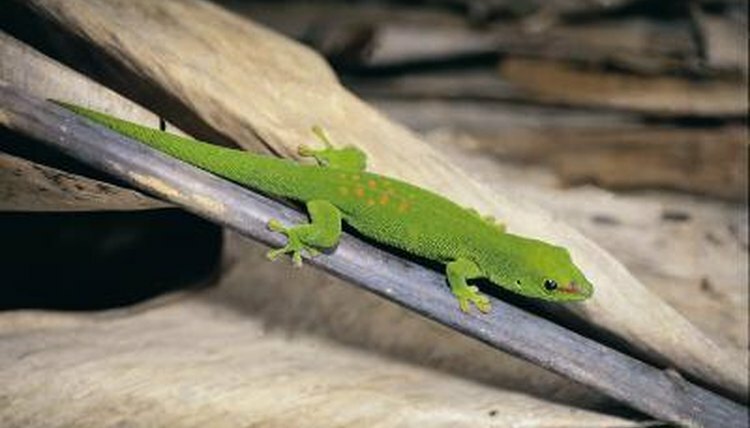 Among the more unusual species is New Zealand's bright green barking gecko (Naultinus punctatus), which actually barks at predators to warn them away. The popular pet leopard gecko (Eublepharis macularis) has a bright yellow skin covered with brown spots. Unlike other geckos, this native of Afghanistan, India and Pakistan has eyelids. Another pair of yellow geckos, Lygodactylus kimhowelli and L. picturatus, share the common name of yellow-headed dwarf gecko. L. kimhowelli has a pale yellow head with a blue body while L. picturatus has a bright yellow head and a pale blue body. Both of these 3-inch-long geckos are native to East Africa. The blue-tailed day gecko (Phelsuma cepediana) from Mauritius and electric blue day gecko (Lygodactylus williamsi) from Tanzania share this unusual color. Both of these geckos are active during daylight hours, basking in the sun in their native habitats or under a compact UV bulb when raised in captivity. The crested gecko (Rhacodactylus ciliatus), also known as the eyelash gecko, Guichenot's giant gecko and New Caledonian crested gecko, was believed extinct until it was rediscovered in 1994. Growing up to 10 inches long in its native habitat of New Caledonia, it may be found shades of in red, orange, yellow, brown or gray. The orange-spotted tokay gecko (Gekko gecko) has a pale gray or blue background of scales covered with orange spots. It makes a series of loud noises, including its signature cry, "Tokay, tokay." Unlike other geckos, handling this reptile isn't the best idea. He's known as the pit bull of the gecko world, hanging onto prey -- or your finger -- for up to an hour.